For archived news, click here. 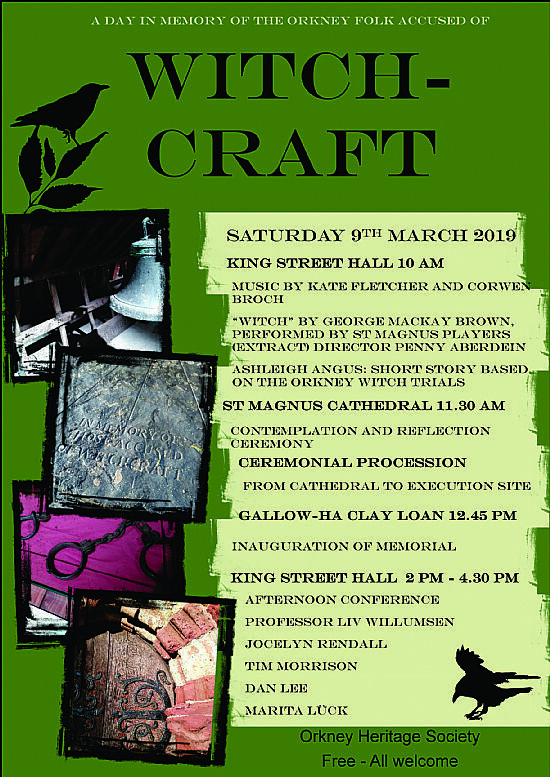 A day events surrounding the unveiling of a new memorial to the historic victims of witchcraft trials in Orkney. For more details see our Witch Trials Memorial pages or the Project's Facebook page. More than thirty people met at the Kirkwall Town Hall on Monday evening to discuss SSEN’s proposals to upgrade Orkney’s grid connections. Representatives from RSPB, Community Councils, Orkney Renewable Energy Forum, Orkney Pilgrimage, Keep Hoxa Beautiful, and Orkney Field Club among others discussed the scheme after a presentation by Orkney Heritage Society’s Neil Kermode. Real concern was expressed at the proposed Trident poles - upwards of 700 very large double poles, standing 56 feet high and 100 yards apart, which will stand in addition to the existing distribution network. 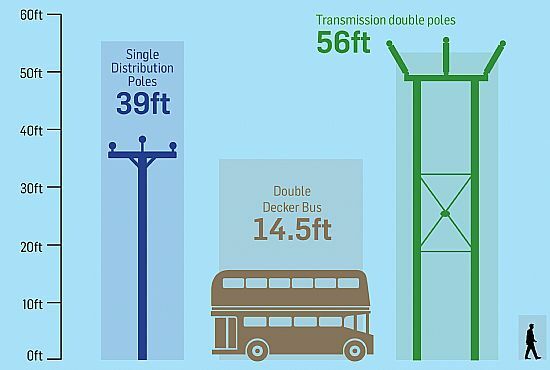 To give some context, Orkney’s existing Hydro poles are 39 feet in height (see illustration). There is similar concern about the visual impact of the planned substation at Finstown. This complex of twelve buildings will have a ridge height of about 45 feet and will sit to the west of Finstown above the Harray Road junction. 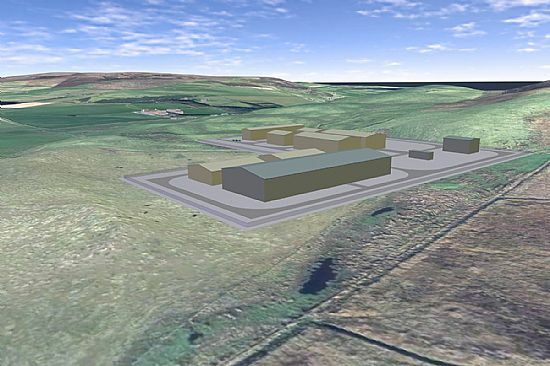 In addition there will be substations on South Ronaldsay and at Ellibister, each of which will have twice the footprint of the new McGregor Industrial Supplies building at Hatston, and a third higher. It was learnt then that an option of an underwater cable across Scapa Flow had been dismissed at a very early stage, based on what appears to be incomplete evidence. The overwhelming feeling of the meeting on Monday evening was that Orkney deserves much better, and that the options of undergrounding and submarining cables, and ‘burying’ substation buildings must be pursued vigorously with SSEN while also informing the Orkney public of the threats of existing plans. Orkney Heritage Society would like to make the Orkney public aware of just how severe an impact on the Orkney landscape the proposed project will have, not just the visual impact of the proposed cables, poles and structures, but also on the natural environment. The public are encouraged to view the detail on the proposals and make their opinions known to SSEN via their website (www.ssen-transmission.co.uk/projects/orkney/), and to complete a poll set up by Orkney Heritage Society - for the poll click here. Public Meeting at Firth Community Centre, Finstown. Chaired by Alistair Carmichael MP. To hear and discuss Orkney Heritage Society's serious concerns about the electrical transmission works planned by SSEN in Orkney and shortcomings in the consultation events already held. While SSEN have just announced some welcome revisions to their proposed works (see here), OHS believe these changes do not go far enough. There are still grave concerns over the impact the infrastructure will have on Orkney's landscape and heritage. Further to our previous message (see below news item), OHS has launched an online opinion poll on SSEN's Orkney Project. By clicking on this link you can enter your views via the OHS Opinion Poll on the SSEN consultation exercise and also on the project itself. OHS will use the responses it gets to ensure its representations remain well grounded. Please do use this system as it allows us to rapidly collate views. It should work on all devices and you can paste text into your reply if required. Finally, please also take the time to respond to SSEN's consultation itself via the SSEN website. (Click here). The above image is SSEN's model showing the view from Grimeston Rd / Harray Rd junction, looking c. south showing the proposed sub-station buildings to the west of Finstown. To see how your location will be impacted and for more detail on the proposed works, including maps showing the proposed routes of overhead power lines and locations of sub-stations, CLICK HERE (Note - you may then need to scroll to top of page and click 'Project Documentation'). We hope to see you at our AGM on Thursday 15 November at the St. Magnus Centre at 7:15pm. Orkney Heritage Society see SSEN's (Scottish & Southern Electricity Networks) proposed works as a threat to Orkney’s heritage. The current proposals to create an Orkney electricity transmission network would see miles of tall poles and a very obtrusive electricity substation near Finstown. We are all in favour of renewable energy and a properly designed network to take this energy out of Orkney. Climate change is one of the greatest threats to Orkney’s heritage and we fear the world – and Orkney – is running out of time to combat it. We have put forward alternatives to SSEN. These involve a shorter route, across Scapa Flow, underground cabling on the entire route as opposed to part of it and much better design of the Finstown substation. Orkney Heritage Society’s concerns deepened as a result of the consultation events held by SSEN in the last week of September about the proposed substation at Finstown and the overhead cables. The Society’s Board will meet mid-month but those members delegated to attend the consultation wish to make clear their concerns. Despite the Society making clear representations and suggestions to SSEN following the last consultation in July the proposed sheds in the latest design would be more visible than that displayed three months ago. We had been hoping to see that SSEN had taken the points being made about the need to lower the level of the site before building the substation. Last week we saw that this was not the case and we remain concerned that the consultation is a sham and the people of Orkney are being ignored. We hope members will support our campaign to see the proposals modified. We would welcome any feedback and help with the campaign. To email OHS click here. The SSEN website has more detail on the project and they have a feedback form here. OHS letter to members 16 Sep 2018 click here. OHS Media Release 1 Oct 2018 click here. We hope to see you at our next public meeting, on Thursday 15th November at 7 pm in the St. Magnus Centre. This is our AGM followed by a talk by Richard Shearer on Orcadians who lost their lives in World War I. 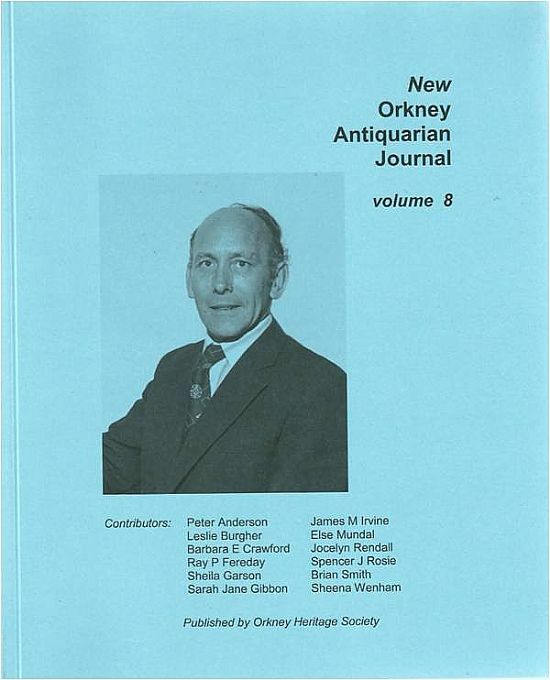 Volume 8 celebrates 50 years of Orkney Heritage Society and is a tribute to the historian William P L Thomson. Tuesday 4th September 2018 at 7.00pm at the St. Magnus Centre, Kirkwall.